4.6 billion years ago, our Solar System formed from a collection of gas and dust surrounding our nascent Sun. While much of the gas and dust in this protoplanetary disk coalesced to form the planets, some of the debris was left over. Some of debris was shattered remnants of planetesimals – bodies within the young Sun’s solar nebula that never grew large enough to become planets, and scientists theorize that large collisions in the early, chaotic Solar System pulverized these planetesimals into smaller pieces. Other debris never came together due to the massive gravitational pull from Jupiter. These rocky remnants are now the asteroids that travel about our Solar System. Since these “leftovers” contain clues about the early days of our Solar System, scientists are eager to study them. Asteroids are rocky, metallic bodies that orbit the Sun. They are made from different kinds of rock and metals, with the metals being mostly nickel and iron. They are sometimes called “minor planets” but they are much, much smaller than the planets or moons. They don’t have atmospheres, but about 150 asteroids are known to have small “moons” orbiting them, and some even have two moons. There are also binary (double) asteroids, where two rocky bodies of roughly equal size orbit each other, as well as triple asteroid systems. At least one asteroid has rings. This surprise discovery was made in 2013 when scientist watched Asteroid Chariklo pass in front of a star. The asteroid made the background star “blink” several times, which led to the discovery that two rings are surrounding the asteroid. Sometimes, the orbits of some asteroids get perturbed or altered from gravitational interactions with planets or other asteroids and they end up coming closer to the Sun, and therefore closer to Earth. These asteroids are known as Near Earth Asteroids, and are classified as NEAs if their orbits bring them within 1.3 AU (121 million miles/195 million kilometers) of the Earth. Asteroids that actually cross Earth’s orbital path are known as Earth-crossers and, an asteroid is called a Potentially Hazardous Asteroid (PHA) if it will come less than .05 AU from Earth. In addition to the asteroid belt, however, there have been recent discussions among astronomers about the potential existence of large number asteroids in the far reaches of our Solar System in the Kuiper Belt and Oort Cloud. There are millions of asteroids in our Solar System. Some scientists estimate the asteroid belt has between 1.1 and 1.9 million asteroids larger than 1 kilometer (0.6 mile) in diameter, and millions of smaller ones. Most of the undiscovered asteroids are likely the smaller ones (less than 100 km across) which are more difficult to detect. Other astronomers estimate there are over 150 million asteroids in the entire Solar System. New asteroids are being discovered all the time. On average, three new NEAs are found every day. As of September 06, 2015, 13,024 Near-Earth objects have been discovered. About 875 of these NEOs are asteroids with a diameter of approximately 1 kilometer or larger. Also, 1,609 of these NEOs have been classified as Potentially Hazardous Asteroids (PHAs), but none at this time are expected to impact Earth. Check the NASA NEO website for updates. Contrary to popular imagery that might be seen in science fiction movies and imagery, the asteroid belt is mostly empty. According to NASA, the average distance between objects in the asteroid belt is greater than 1-3 million km. The asteroids are spread over such a large volume that you likely would not run into an asteroid if you sent a spacecraft through the asteroid belt. Even though there may be millions of asteroids in the asteroid belt, most are small. Astronomers say if you put all of them together, the combination would be smaller than our moon. You can find more information about NASA’s NEO Search Program here. This animation by Scott Manley shows the progression of new asteroid discoveries since 1980. It was created using data from the IAU’s Minor Planet Center and Lowell Observatory. Ceres compared to asteroids visited to date, including Vesta, Dawn’s mapping target in 2011. Image by NASA/ESA/JAXA. Compiled by Paul Schenck. Most asteroids are irregularly shaped, though some are nearly spherical, and they are often pitted or cratered from impacts with other asteroids. As they revolve around the Sun in elliptical orbits, the asteroids also rotate, and have some quite erratic movements, and literally tumble through space. The size of what classifies as an asteroid is not extremely well defined, as an asteroid can range from a pebbles, to a few meters wide – like a boulder — to objects that are hundreds of kilometers in diameter. 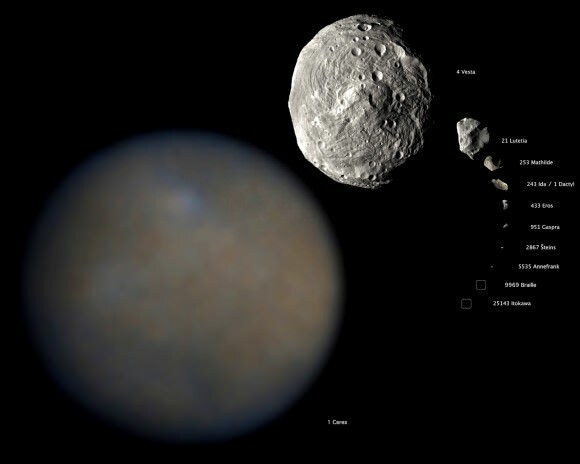 The largest asteroid is asteroid Ceres at about 952 km (592 miles) in diameter, and Ceres is so large that it is also categorized as a dwarf planet. Over 200 asteroids are known to be larger than 100 km (60 miles), with sixteen asteroids known to have diameters of 240 kilometers (150 miles) or greater. The following animation is based on a 2008 a study of the size distribution of asteroid families using data from the Sloan Digital Sky Survey and was created by Alex Parker. Most asteroids are made of rock — with some composed of clay and silicate — and different metals, mostly nickel and iron. Other precious metals have been found on some asteroids, including platinum and gold. A wide variety of minerals have also been found on various asteroids including olivine and pyroxene, which are also found on meteorites that have landed on Earth. Most asteroids contain vast amounts of carbon, which means they closely follow the elemental composition of the Sun. There are indications that asteroids also contain water or ice in their interiors, and observations by the Dawn mission shows indications that water may have flowed across the surface of Vesta. A few start-up companies have proposed mining asteroids for their resources. These included Planetary Resources and Deep Space Industries. You can find more details about what asteroids are made of at our article here. Asteroids are different from comets, which are mostly rock and ice. Comets usually have tails, which are made from ice and debris sublimating as the comet gets close to the Sun. Asteroids typically don’t have tails, even those near the Sun. But recently, astronomers have seen some asteroids that have sprouted tails, such as asteroid P/2010 A2. This seems to happen when the asteroid has been hit or pummeled by other asteroids and dust or gas is ejected from their surfaces, creating a sporadic tail effect. These so-called “active asteroids” are a newly recognized phenomenon, and as of this writing, only 13 known active asteroids have been found in the main asteroid belt, and so they are very rare. Asteroids have a few different classifications based on their location and make-up. Trojans: These asteroids share an orbit with a larger planet, but do not collide with it because they gather around two special places in the orbit (called the L4 and L5 Lagrangian points). There, the gravitational pull from the sun and the planet are balanced by a trojan’s tendency to otherwise fly out of the orbit. The Jupiter trojans form the most significant population of trojan asteroids. It is thought that they are as numerous as the asteroids in the asteroid belt. There are Mars and Neptune trojans, and NASA announced the discovery of an Earth trojan in 2011. Near-Earth Asteroids: These objects have orbits that pass close by that of Earth. Then, there are subgroups of Near-Earth asteroids, and are categorized by their orbits. Atiras are NEAs whose orbits are contained entirely with the orbit of the Earth, having a distance of less than 1 AU. They are named after asteroid 163693 Atira. Atens are Earth-crossing NEAs with semi-major axes smaller than Earth’s, with a distance of less than 1 AU. They are named after asteroid 2062 Aten. Apollos are Earth-crossing NEAs with semi-major axes larger than Earth’s, with a distance of less than 1 AU. They are named after asteroid 1862 Apollo. Amors are Earth-approaching NEAs with orbits outside of Earth’s but inside of Mars’ orbit. They are named after asteroid 1221 Amor. C-type (chondrite) asteroids are most common, making up about 75 percent of known asteroids. They are very dark in appearance and probably consist of clay and silicate rocks. They are among the most ancient objects in the solar system. Their composition is thought to be similar to the Sun, but depleted in hydrogen, helium, and other volatiles. C-type asteroids mainly are in the asteroid belt’s outer regions. S-types (stony) are made up of silicate materials and nickel-iron, and accounts for about 17 percent of known asteroids. They are brighter than C-type and they dominate the inner asteroid belt. M-types (metallic) are made from nickel and iron and accounts for about 8 percent of known asteroids. They are brighter than C-type and they can be found in the asteroid belt’s middle region. How likely is it that our planet could be hit by a large asteroid or comet? We do know that Earth and the Moon have been struck many times in the past by asteroids whose orbits bring them into the inner Solar System. You can see pictures some of Earth’s largest and most spectacular impact craters here. Studies of Earth’s history indicate that about once every 5,000 years or so (on average) an object the size of a football field hits Earth and causes significant damage. Once every few million years on average an object large enough to cause regional or global disaster impacts Earth. There is strong scientific evidence that asteroid impacts played a major role in the mass extinctions documented in Earth’s fossil records. It is widely accepted that an impact 65 million years ago of an asteroid or comet at least 6 miles (10 kilometers) in diameter in the Yucatan peninsula, known as the Chicxulub crater is associated with the extinction of the dinosaurs. We know of only a handful of recent large asteroid impacts. One is the forest-flattening 1908 Tunguska explosion over Siberia (which may have been the result of a comet) and another is the February 2013 meteor that exploded over Chelyabinsk, breaking windows and injuring many, mostly from broken glass. But a recent study by the B612 Foundation found that there were 26 explosive airburst events similar to the Chelyabinsk event recorded from 2000 to 2013. The explosions asteroids ranged from one to 600 kilotons in energy output. NASA says that about once a year, an automobile-sized asteroid hits Earth’s atmosphere, creates an impressive fireball, and burns up before reaching the surface. NEOs still pose a danger to Earth today, but NASA, ESA and other space agencies have search programs that have discovered hundreds of thousands of main-belt asteroids, comets. None at this time pose any threat to Earth. You can find out more on this topic at NASA’s Near Earth Object Program website. The International Astronomical Union’s Committee on Small Body Nomenclature approves the names for asteroids, but suggestions come from scientists and from the public. Asteroids are also given a number, for example (99942) Apophis. The Harvard Smithsonian Center for Astrophysics keeps a fairly current list of asteroid names. All asteroids and comets visited by spacecraft as of November 2010 Credits: Montage by Emily Lakdawalla. Ida, Dactyl, Braille, Annefrank, Gaspra, Borrelly: NASA / JPL / Ted Stryk. Steins: ESA / OSIRIS team. Eros: NASA / JHUAPL. Itokawa: ISAS / JAXA / Emily Lakdawalla. Mathilde: NASA / JHUAPL / Ted Stryk. Lutetia: ESA / OSIRIS team / Emily Lakdawalla. Halley: Russian Academy of Sciences / Ted Stryk. Tempel 1, Hartley 2: NASA / JPL / UMD. Wild 2: NASA / JPL. We’ve gained knowledge of asteroids from three main sources: Earth-based remote sensing, data from spacecraft and laboratory analysis of meteorites. 1801: Giuseppe Piazzi discovers the first and largest asteroid, Ceres, orbiting between Mars and Jupiter. 1898: Gustav Witt discovers Eros, one of the largest near-Earth asteroids. 1991-1994: The Galileo spacecraft takes the first close-up images of an asteroid (Gaspra) and discovers the first moon (later named Dactyl) orbiting an asteroid (Ida). 1997-2000: The NEAR Shoemaker spacecraft flies by Mathilde and orbits and lands on Eros. 1998: NASA establishes the Near Earth Object Program Office to detect, track and characterize potentially hazardous asteroids and comets that could approach Earth. 2006: Japan’s Hayabusa becomes the first spacecraft to land on, collect samples and take off from an asteroid. 2006: Ceres attains a new classification — dwarf planet — but retains its distinction as the largest known asteroid. 2007: The Dawn spacecraft is launched on its journey to the asteroid belt to study Vesta and Ceres. 2008: The European spacecraft Rosetta, on its way to study a comet in 2014, flies by and photographs asteroid Steins, a type of asteroid composed of silicates and basalts. 2010: Japan’s Hayabusa returns its asteroid sample to Earth. 2010: Rosetta flies by asteroid Lutetia, revealing a primitive survivor from the violent birth of our solar system. 2011-2015: Dawn studies Vesta, becoming the first spacecraft to orbit a main-belt asteroid. It now is studying the dwarf planet Ceres, located in the main asteroid belt. Below is a list of links to articles about asteroids in general, asteroid related events in history, and some specific asteroids. Many hours of research are waiting for you. Enjoy! You can find additional information from NASA at the Asteroid page of their Solar System Exploration website. I love & enjoy all the technical data astronomers and scientist discover and share. Man has come a long way in understanding the Universe and it’s dynamics. What has been learned for sure (besides the technical information) is, we actually know virtually nothing about its design, its intricate functions, its bottomless energy. What I do find disingenuous is how some statements put out there are imperialistic in nature. Don’t get me wrong now. Hypothesizing, conjecture, theories all have their place in knowledge. You couldn’t get ahead if you didn’t practice the former & latter. Nevertheless, making concrete statements such as “Black Holes swallow- nothing can escape it” & “13 billion yrs ago, the Big Bang did this and did that” …. well, there’s no way (yet) of proving these statements to be what actually happened. It would be more beneficial (I believe) if instead such comments such as : “This is what we think happened” or “We actually don’t know” or, well, I think you know what I mean. You, sir (I think), have much to read and learn.